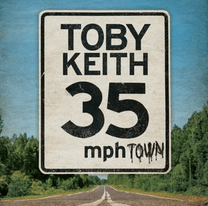 We have had an unusual gap of two years since Toby Keith’s “Drinks after work” album. He has been releasing albums yearly since 2005 and the time off seems to have been beneficial. 35 mph town sees Keith back to his playful best. He has always excelled with alcohol related themes and here we have “Drunk Americans” and “Every time I drink I fall in love”. This does not however deflect from Keith’s superbly rich voice. After all he was selling out Wembley Arena long before Zac Brown. This man has a very extensive UK fan base and rightly so. Highlights for me are the islands influenced “Rum is the reason” and the Jimmy Buffett duet “Sailboat for sale”, two tracks which feature wonderful Caribbean rhythms which one might associate with Kenny Chesney. Keith’s strengths have always been his song writing depth and “Beautiful stranger” that closes the 10 track album is up there with his best. He wrote 9 out the 10 songs on offer. All apart from the aforementioned “Rum is the reason” which is a Buffett contribution. We have already had two single releases from this album. “Drunk Americans” came out stateside last year and performed poorly bearing in mind Keith’s popularity and his capacity to sell out venues. It reached a modest 33 on the country charts. The second release, the title track is also struggling to reach the top 30. Both are included here and open the album strongly. I was hoping that Keith might grace us with an attendance again in the UK. Surely a headliner of the future for C2C? Maybe he’s lining up another solo tour and this album is a welcome addition to his extensive back catalogue which now stretches to 18 studio albums.